MLS# 819001663 – 384 Meadow Grove Street, La Canada Flintridge, CA 91011 – Robbyn Battles | Battles Real Estate | JohnHart "Real Estate Redefined"
Listing courtesy of Carey Haynes (CalBRE #01144568), COMPASS. 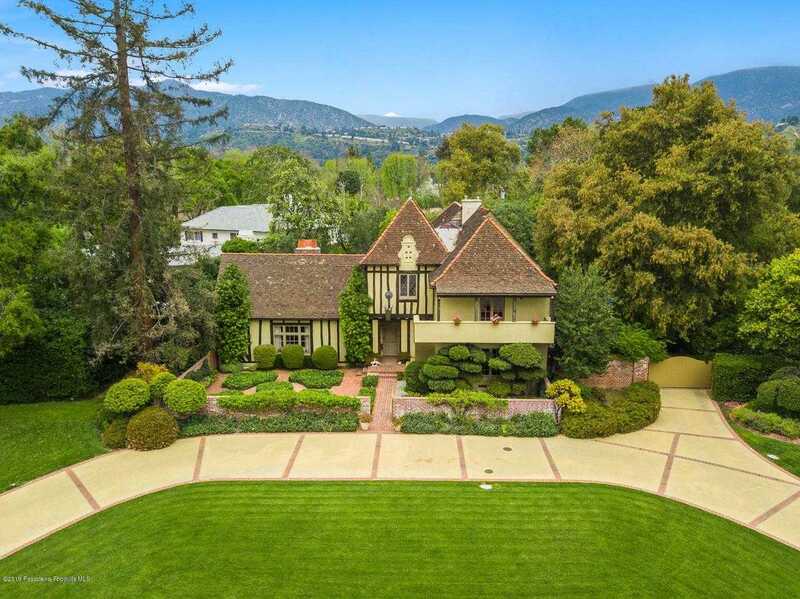 Built in 1931, this iconic French Norman Revival garners attention from first sight. Designed by Robert H. Ainsworth of Pasadena and build by The Cooper Brothers of La Canada Flint. The home sits prominently on a corner lot behind a field of lawn with a mature landscape in the exclusive Meadow Grove circle. Be welcomed through the manicured courtyard garden to the formal entry. Make your way to the step down grand living room, ”reception hall” with a vaulted open beam ceiling featuring hand hewed beams and trusses, ornate wainscoting, grand fireplace with custom mantle and surround, hardwood peg and groove floors and leaded glass bay window. Light filled family room with views of the private patio and pool yard. Large formal dining room with easy access off kitchen. Breakfast nook, butler’s pantry and service bar room with sink complete the entertaining space. 4 bedrooms upstairs including a master suite with sleeping porch, individual changing rooms/closets and access to two bathrooms. Additional suite on ground level. Guest bedrooms provide easy access to bathrooms and open hallway. Be swept away by the romance of this property’s details as it is a true work of art. Building size: 5255 sq ft. Please, send me more information on this property: MLS# 819001663 – $3,700,000 – 384 Meadow Grove Street, La Canada Flintridge, CA 91011. I would like to schedule a showing appointment for this property: MLS# 819001663 – $3,700,000 – 384 Meadow Grove Street, La Canada Flintridge, CA 91011.